So, my friend Kashmir Knitter over on the Knittyboards posted this link the other day. A discussion ensued, including the logistics and likelihood of success in making it oneself. KK insisted that fondant was actually quite easy to work with, and even posted a link to a recipe to make it oneself from marshmallows. I was starting to get really psyched about it, because that came out well. Alice and Cashin came over around 11am, and we got started mashing the other cake bits together with frosting and making the balls to cover in chocolate. 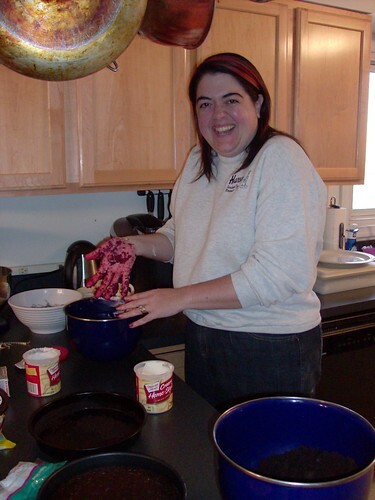 Red velvet cake and frosting looks… gory. After a sushi/Chinese food break while the balls firmed up in the freezer, we started covering and decorating. 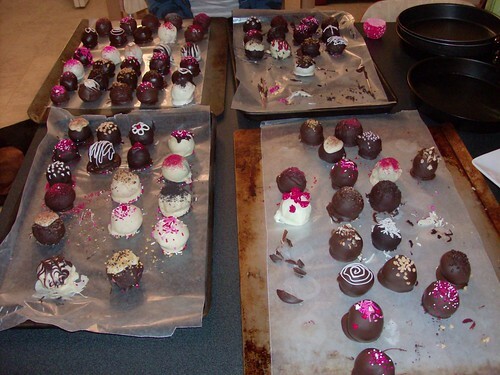 After about three hours, we had a LOT of cake truffles. He loved it. And once he realized that I made the “candy” AND that the box was a cake, he was even more impressed. I’m SO proud of myself. They came out even prettier than I hoped. 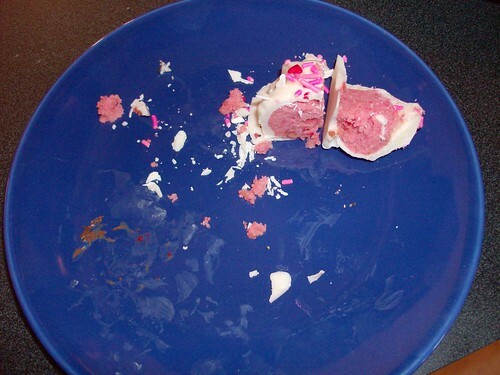 Still tasted just fine, though. 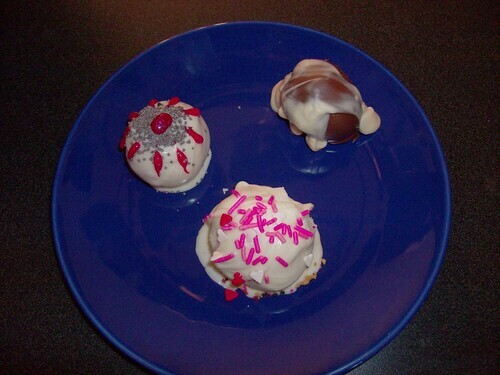 February 13th, 2009 | Tags: Food | Category: Misc. That looks so amazingly good! One day when I’m feeling industrious in the kitchen I may have to give it a go. Looks wonderful. 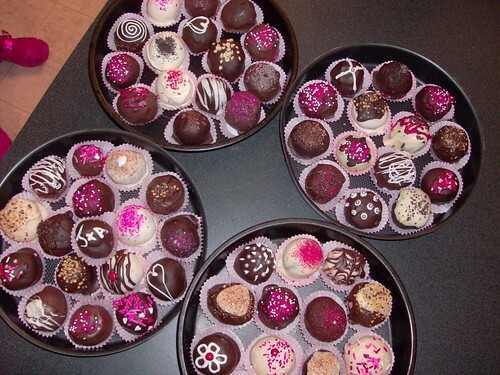 I would never attempt the cake but I would like to try the cake truffles. That looks delicious! I’ve never made fondant. Maybe someday . . . I bought a box of strawberries and a couple bars of Ghirardelli semi-sweet . . . yep, I’m going to be making chocolate-covered strawberries. A lot cheaper than driving over to the mall and getting one dark-chocolate covered strawberry from Godiva. Now that looks like a really fun way to spend the day! Gorgeous results; I’m very impressed. That is too cool! 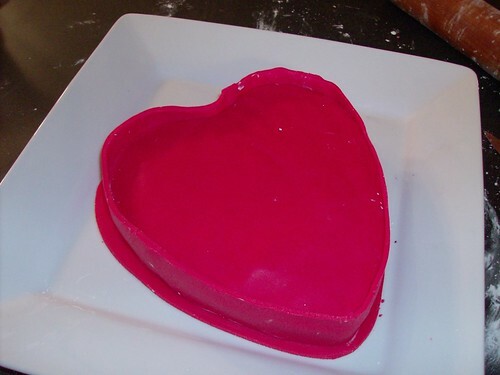 I had no idea one could make fondant oneself… must give it a go! I love it! That looks great! WOW! What a fantastic Valentine’s gift. 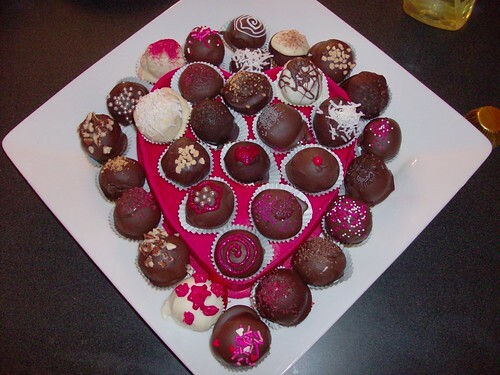 I have made the truffles before. Thanks for the link. Bakerella has one excellent blog! Spectaculaaaaarrrrr! Happy VD day Pam! Delicious!!! Great job!!!! You are the second site that referred me to Bakerella today (which I’ve bookmarked now!)!! Sooooo many of those treats look delish!!! How were the red velvet cookie?! Yum! I hadn’t seen these links before…perhaps I’ll try them out some weekend & surprise J. Happy V-day! Oh Yum!! Great job on the goodies! Yeah, that’s EXACTLY the song I wanted to have stuck in my head all day. Wow! These look terrific! And what fun to do it with friends. None of my friends would ever want to make these – but they would definitely want to eat them! WOW! I mean, really WOW. Those are beautiful! That is some super valentine’s day dedication! I bet they tasted great with the port. DAMN that looks good!! nice job!